Susquehanna Service Dogs: "He has hope and her name is SSD Savannah!" "He has hope and her name is SSD Savannah!" This is what we do, together. It is what Susquehanna Service Dogs is all about. It’s why what we do together matters. When you donate to Susquehanna Service Dogs you share in giving that kind of hope, making that kind of difference. As Bill Glaser told us recently, “I am more in tuned to life and re-engaged in it.” His wife, Ali, has her own story to tell. “Last month Team Glaser received THE greatest gift from the universe by far. Her name is SSD Savannah and she works for my superhero hubby, Bill. If you ever get to witness these two in action, it’s truly a blessing. I have such an immense gratitude. Savannah and I have been sitting with Bill, he has been in the hospital since yesterday morning. As I sit here with them I am feeling the tremendous blessing that is our sweet Savannah. She has supported him from the moment we arrived by ambulance and only leaves his side for potty breaks and to sleep at home each night. Unfortunately, we are here often and will continue to make the best out of every situation. 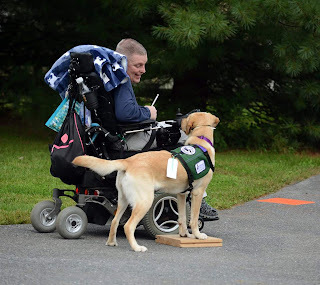 Here is what is different this time around though…..a service dog. A furry little healer, a mountain mover, a motivator and a bond beyond words. The energy this dog can spread is pure magic, PURE MAGIC! She shares it soooo willingly, with the staff here, her family, but more important, her guy. I sit and watch them together and my heart melts. She is healing him, in a way that I can’t anymore. He has hope, and her name is SSD Savannah! To be a part of stories like Bill and Ali’s--to be a life changer--consider a donation to Susquehanna Service Dogs. Consider the next person and the next family your contribution will impact. Consider how your support in supporting others to live their best lives, lives more fully engaged, will make a real difference. As the year comes to an end and you consider where your donations will go, please consider Susquehanna Service Dogs!